Yesterday, while grocery shopping with my youngest daughter, we spotted some beautiful looking salmon steaks in the meat market case. M suggested that we buy a few steaks to grill for dinner. We also picked up some squash, (to make our Autumn Squash and Apple Bake) salad fixings, and potatoes. I’m happy to say that we had the perfect fall grilling weather. For the marinade, I use Marzetti’s brand Italian salad dressing because it has a little sugar in it. This caramelizes during the grilling process and gives the salmon a great texture. We enjoyed a lovely Sunday evening meal together and all agreed that we should add more fish to future dinner menus. Add salmon and marinade to large, shallow non-aluminum baking dish or plastic bag; turn to coat. Cover, or close bag, and marinate in refrigerator, turning occasionally, up to 30 minutes. 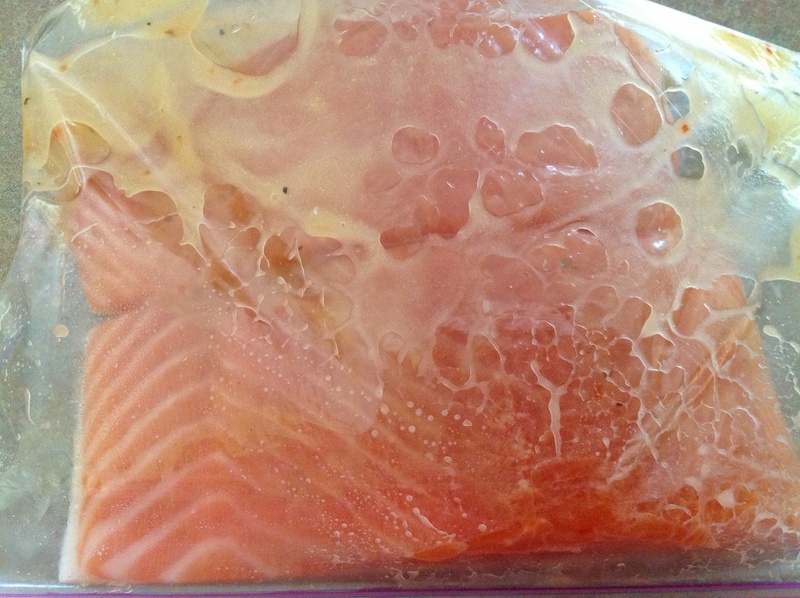 Remove salmon, discarding marinade. 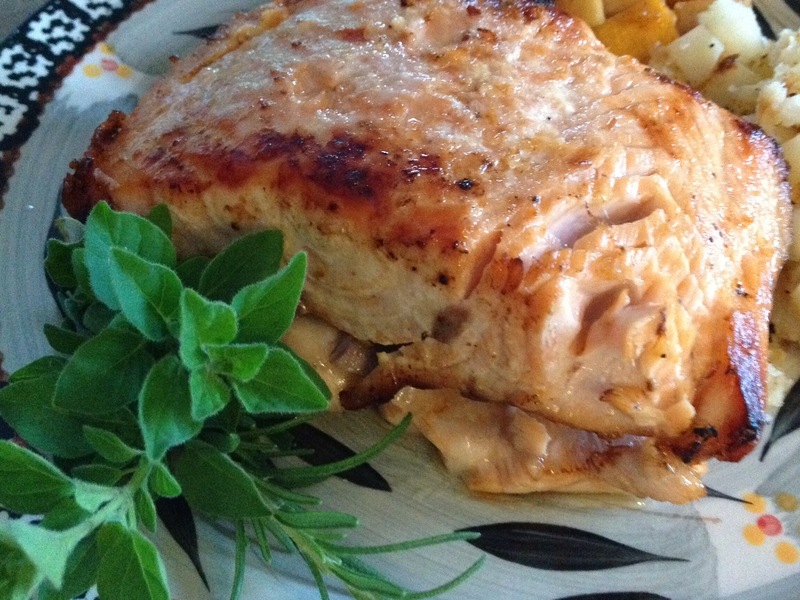 Grill or broil salmon, turning once, cook until salmon flakes with a fork (about 3-5 minutes per side on high heat). Mmmmm, they really are beautiful! Thanks for stopping by! And yes…it sure was yummy! Thanks for your kind words…Salmon is something we are getting used to in our house. This recipe made us feel as though we should be eating more fish. Thanks for visiting my blog! For years, the only salmon I would eat was on top of a bagel with cream cheese. (Jewish family…) I have grown to really appreciate it in general. This recipe looks simple and delicious! Thank you! #@*& yeah been lookin for a new salmon recipe! Had to edit your comment for the young and old that might take offense, Vulgar Chef… Thanks for visiting my site and for sending along a comment! And this recipe couldn’t be any easier…just marinade for a short time and pop it on the grill. I thank you for visiting my site and for your kind comment. Looks incredible! I will have to try this soon, Salmon is one of my favourite foods. Thanks for stopping by and liking littlelivingBIG. this is the way I have always cooked it, Heidi…It seems to work out perfect every time. Thanks for your comment! This is one of my favorite recipes! I do the exact same except I place a layer of thinly sliced onions on top before baking as well. They get soft and caramelized. It’s super delicious! Sounds great, Lauren… I’ll have to try that!